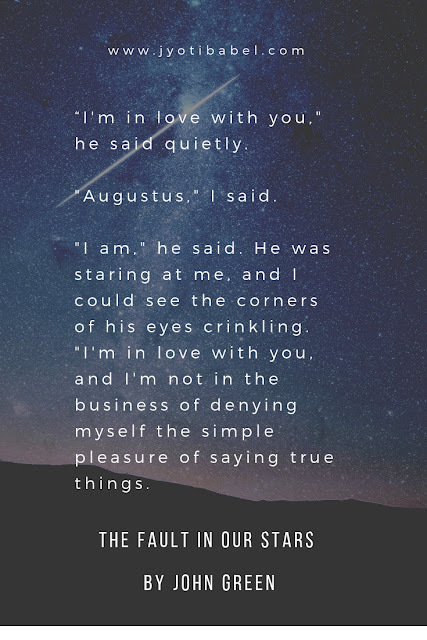 Reading ‘The Fault in Our Stars’ by John Green was an emotional rollercoaster ride for me. A book that has the backdrop of cancer certainly cannot really be an easy read, but was it fulfilling? Yes, it was and it was well worth my time and tears. As the story unfolds before you – the characters will seep into you and so will their emotions – their tales of love and loss, their triumphs and defeats and their laughter and tears. While reading the book the hopelessness of the fragility of life got me often, but it also gave me the sense that life is what you make of it. The author has done a great job in taking the readers on a journey that is filled with despair and yet is hopefully beautiful. As the story begins, the readers are introduced to seventeen-year-old Hazel Grace. She is fighting her battle with thyroid cancer that has spread to her lungs as well, making it absolutely essential for her to be tethered to an oxygen tank for breathing. On continuous pestering of her mom, Hazel attends a cancer support group where she meets Augustus. Augustus has had his own battle with cancer which is in remission now; he had to pay for it by getting one of his leg amputated. The attraction between Hazel and Augustus is palpable. Hazel is an avid reader and a philosopher at heart. She shares her favourite book – An Imperial Affliction with Augustus; the story in the book revolves around a girl – Anna - who suffers from cancer. Hazel feels a strong connection with the character of Anna and her philosophies. 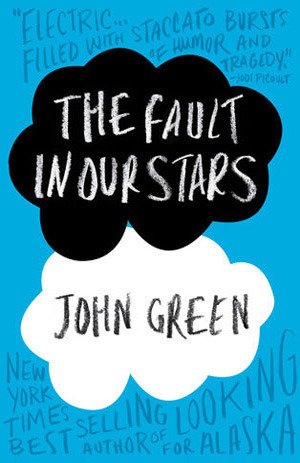 This book has a good role to play how the love story of Hazel and Augustus is served to the readers. You need to read the book to know the hows. I just can say – if you are philosophically inclined and have a thing for love stories, you won’t be disappointed. Oh, yes! Keep a box of tissues handy, you will need those. The best thing about the book is that even with such a depressing and tragic backdrop, it is not a sad sick-lit. This book doesn’t talk about the glories of cancer survivors, it doesn’t tell you that you can fight it with all might and defeat it and be a hero; it gives us the real picture – that you have to fight it and you might lose it too– but you got to still take the best of what you have got. The book is peppered with witty and humorous dialogues that will make you chuckle and smile. The plot is beautifully crafted and the characters are quite believable. Green has done a commendable job is showing the strength of the characters as they fight the battles of their lives but he also shows how hopeless and depressed they can feel. 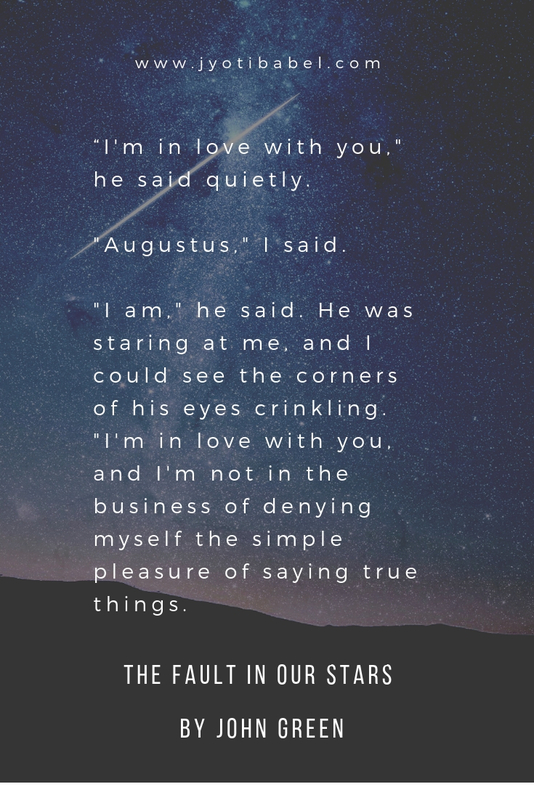 Augustus is a character that you will fall in love with. Disarmingly charming, courageous, hopelessly romantic and witty, he shows you how there is a possibility of infinity even in a short life. All the other characters complement the story beautifully, Augustus’ friend – Isaac shines in his own space. Your heart will melt as you see how the families of both Hazel and Augustus face the realities of life – fearing the worst, but still not giving up on hope. The Fault in Our Stars by John Green remains among one of my best reads this year so far and it comes highly recommended from me. This book has been adapted into a movie and I really can’t wait to watch it now. If you are not into reading books, you can watch the movie. Update: I found the movie online on HotStar and watched it. The story shines in the movie also. Go watch it!